This website portrays the traditional, pure art of Chinese brush strokes through the Master Andrea Allen. As a Chinese Brush Artist, Andrea Allen has developed a unique style that combines the traditions of the Chinese Masters with a subtle, contemporary flair. She studied with a Chinese Master for six years, and has been painting and teaching this style for over two decades. 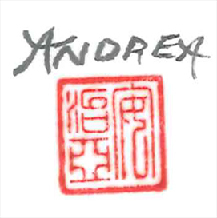 Andrea utilizes many ancient Chinese techniques such as grinding her own Sumi ink, often mixing it with watercolor, loading the Calligraphy brush, and applying it to handmade rice paper, with a minimal number of strokes to complete each painting. She carefully balances the unpainted and painted spaces in each composition, creating a tranquil flow throughout each painting. Ancient Chinese symbolism and philosophy influence her work, enhancing the feeling of vital energy and serenity. The inherent effect is for the viewer to be effortlessly invited into each painting, to experience a peaceful balance and harmony in a timeless continuum. Andrea has exhibited extensively throughout the Bay Area, including the Asian Art Museum in San Francisco. For over 15 years, she had a studio in Sausalito, where she created, sold, and taught her Chinese Brush style paintings, ceramics, urns, prints, greeting cards. Andrea welcomes custom commissions in paintings, ceramics and scrolls. To contact Andrea please fill in your contact information in the form below. Thank you. this article This website portrays the traditional, pure art of Chinese brush strokes through the Master Andrea Allen. Copyright © 2019 Andrea Allen. All rights reserved.